The simplest definition of a rabbi is a Jewish person who teaches the Torah. These teaching duties can also be expanded to include preaching to congregations and serving as the keeper of the synagogue. In Orthodox Judaism rabbis are always male, but in reformed congregations they can be female as well. 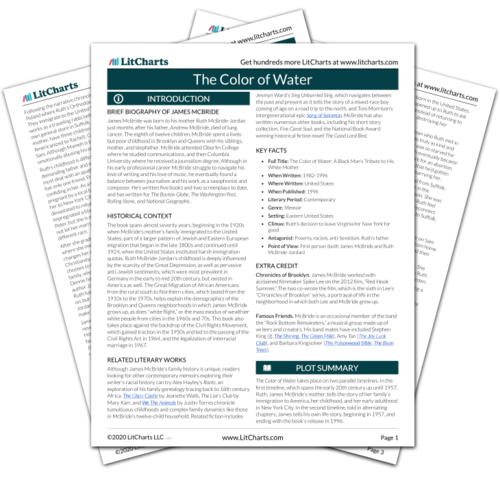 The timeline below shows where the term Rabbi appears in The Color of Water. The colored dots and icons indicate which themes are associated with that appearance. Sanders-Schneider, Ivy. "The Color of Water Term: Rabbi." LitCharts. LitCharts LLC, 9 Nov 2017. Web. 18 Apr 2019. Sanders-Schneider, Ivy. "The Color of Water Term: Rabbi." LitCharts LLC, November 9, 2017. 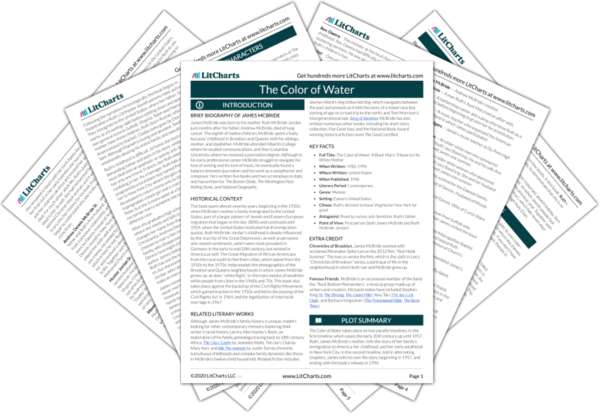 Retrieved April 18, 2019. https://www.litcharts.com/lit/the-color-of-water/terms/f2e3cd71-08ff-4e0d-878a-bf3aa56295d9.